So The Captain is turning 8, and we’re having a party in a couple of weeks. I like having birthday parties because I like to plan parties in general. I like designing all the graphics stuff and shopping for loot bag stuff and baking cupcakes. Especially the cupcakes part. YUM. Back when The Captain turned 4, we had his first party and we thought it would be one of maybe two or three he’d have in his life. But then someone I was talking to (the poker girls, maybe?) mentioned that the window for traditional birthday parties – with the games and the presents and the candles – was fairly narrow. I guessed that age 8 would be the last year for the big party – after that, maybe there would be the odd sleepover with one kid, or taking a best friend to a hockey game, but it wouldn’t be the same. So I totally strong-armed Sir Monkeypants into letting me have a party every year until age 8, so this is it – the last big one for The Captain. This year, we asked The Captain what he wanted to do and he said he would like to pretty please play video games until his eyeballs bled. And I said, “YES YES YES” to that, because I was afraid he was going to ask to go to Cosmic Adventures, which we totally could not afford. Having a bunch of friends over to play Mario Kart until someone has a seizure? AWESOMELY FREE. That font is called Continuum and it’s the same font used in the Wii Logo. No one cares, but I know it’s there. It’s all in the details, people. I had the poster printed and laminated at Staples from an image I found online. It was expensive – $25 – but hopefully reuseable. 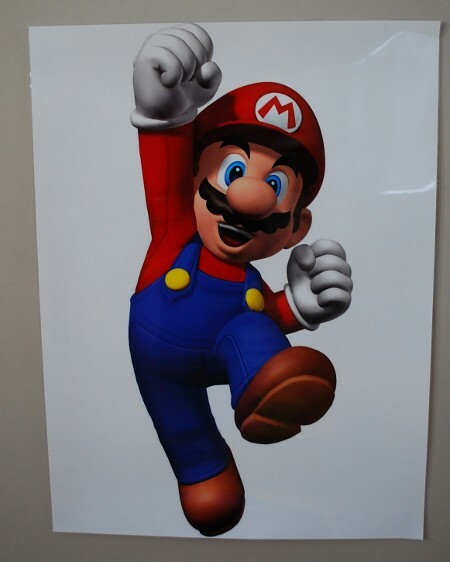 Sir Monkeypants pointed out, though, that we probably could have found a Mario poster at WalMart for $5. So um, yeah, maybe do that if you want to recreate this magic. 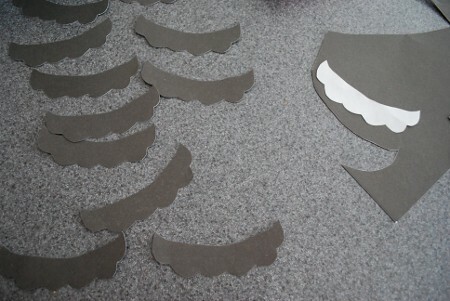 The moustaches are cut out of black bristol board – I had some scrap on hand – from a pattern I made by tracing the appropriate part of the poster. I made these boards from images I found online – it’s just a table in a Word document, printed out and pasted onto coloured paper I already had. I bought a bag of random buttons at Zellers to use as markers but you could use anything from around the house – washers, macaroni, Lego pieces. It just happens that the Little Miss is really into gluing crafts that involve buttons, so the button bag was worth it to me. For prizes for the Bingo (and the Moustache game), I just bought some inexpensive Hot Wheels. Our kids adore this game at parties. You put the picture on your head (we tape it to a hat) so you can’t see it. Then you ask yes-or-no answers to try to guess who “you” are. 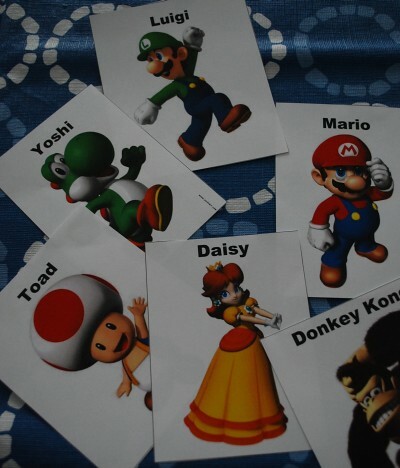 Hopefully the boys at the party know the Mario characters well enough for this game to be a success – in the past we’ve played it with Star Wars characters and Disney characters and it went well. We let the kids keep their little picture when they guess and that’s a plenty good “prize” – in fact, one thing we really love about this game is that there is no “winner,” per se, so it’s great to play with the five and six-year-old crowd that are ready for games but don’t like to lose. 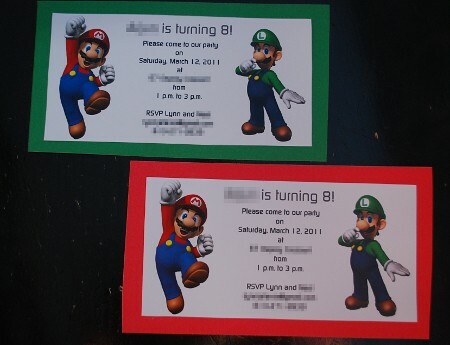 Once again, I made these cards by shamelessly scamming images from the internet and printing them out in colour. I AM CHEAP. 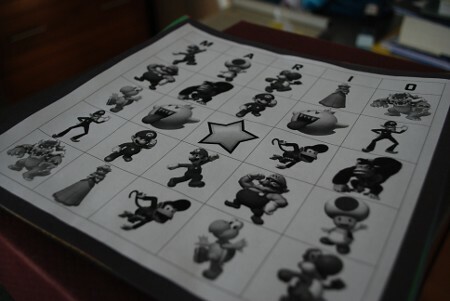 So there’s these classic type games, plus there will be two different video game stations, plus a Lego station. Eight-year-old boy HEAVEN, I tell you. 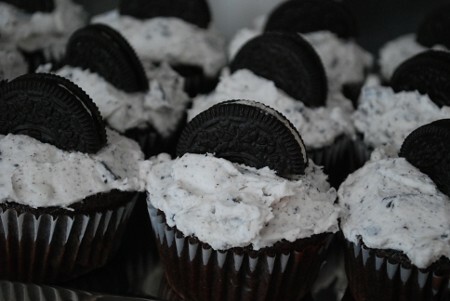 They are cookies and creme cupcakes from Vegan Cupcakes Take Over The World, which is the awesomest cookbook ever. Well, second awesomest. I like to put one big thing in the loot bag rather than a bunch of small things, and since we saved money on just about every other aspect of this party I blew the budget and got each boy one of those new Lego board games (the smallest ones). Don’t feel slighted if you personally prefer the many-small-things loot bag. 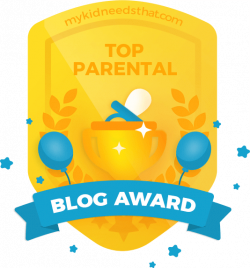 Frankly, my kids like that a lot better – it’s like a treasure trove of pure delight. However, I like the one-big-thing and this party is nothing if not ALL ABOUT ME, so Lego games it is. And that’s it! Hopefully it all goes well…and if not, we have a full week of March Break to recover. I’ll just say this one more time….why don’t you plan parties for a living??? You ROCK. Seconded. 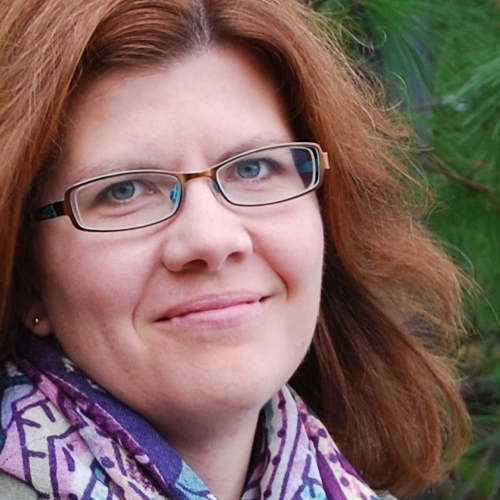 You should totally be a party planner when you’re ready to rejoin the workforce. I can’t think of anything else an 8 yr old guy would LOVE more. And those cupcakes look devine. You rock, yet again. Have a great time and happy birthday Captain! Amazing. I just need to know one thing. How long did all of this tak you? Not too long – almost everything could be done from my couch with my laptop, and I’m a huge fan of that kind of “work”! All the graphic design stuff took a couple of evenings and then I just had to print it out and cut it out. Everything that I needed to shop for was gathered in one morning’s worth of errands. So less than a week, for sure. Those are some great ideas! Way better then Cosmic. Seriously, I will hire you to plan MY next birthday party. You are a phenomenon, woman. I like the one big thing loot bag too. Actually loot bags in general make me hyperventilate. 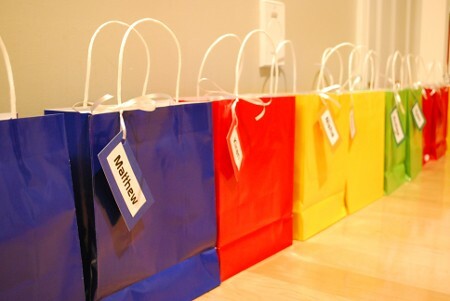 Where were you, oh party guru, when I held my son’s first birthday party and had NEVER HEARD OF loot bags?? They may have made it to Niagara Falls by now, but back in the mid-80s I think they were a strictly Ottawa phenom. JUST THINK of the embarrassment you could have saved me – I was summarily dissed by all the kids at that lame party. You seriously have to go into the business, my friend! Wow. You are awesome. I want you to come and plan parties for me. I also want you to make me those cupcakes. I will consume them all. All cool stuff! I’m glad you couldn’t attend M’s 4th birthday party last year. Basically ten 4-yr olds ran all over our house for two hours. And then we even opened gifts. (I read somewhere it can be a good way to subtly say “It’s time to go home now, people). Anyway, I clearly need some good ideas, so I’ll take a look at the last four years of your birthday blogs. Oh! I’m so glad the gift thing came up. My kids recently went to a birthday where the gifts weren’t opened during the party. We always open gifts at the party as we find it’s one of the things that excites the guests the most (general swarming of birthday child punctuated with exclamations of “Open mine!”, “Look what I got you!”). Also my kids always come home from parties reeling off the list of what the birthday child got. I can understand why sometimes gifts aren’t opened but I guess my feeling is, if you don’t open the gifts at the party, with a chance to look the guest straight in the eye and thank them, then a thank you card is really necessary. This party on the weekend had 21 guests so I’m guessing the child raked in several hundred dollars worth of gifts and I’m almost positive, from past experience, there will be no thank yous sent out. Once again, I’m completely blown away by your party planning skills and creativity. And I’m definitely going to have to check out that cookbook. Those cupcakes look AMAZING! Very mean picture to post… this pregnant lady gets heartburn from even LOOKING at chocolate. My boys would go nuts for the party you’ve planned. A lucky boy, the Captain is.